Comfortable and Reliable:Comfort and no leak is the priority,with air-support cells design to limit air movement and heat loss.The cubed surface design fits the body's natural curves,whether you sleep on this on your back,sides or stomach,you can always feel comfortable. The specially designed Two Way Valve prevent the air leak,so there's no worry about get up and inflate it in the middle of the night, just have a good sleep. Ultralight and Durable: Premium ultralight Ripstop 20D Nylon fabric and extruded TPU Lamination,no any chemical smell. (R-Value: 1.3) It gives you a durable sleeping pad,no worry about sharp stone or branch. Weigh only 14.5 oz, our Moon Lence Camping Pad is easy to carry and perfect for your tent and hammock. Easy to Inflate and Deflate: Simply open the top portion of the double-decked air valve and blow air into it, only 8-10 breaths. Open the bottom of the valve to deflate,only in seconds. Folding size:8"x3.5",Inflated size:73" x 21.6" x 2.2". A Great Buy of Moon Lence Camping Set: Our Camping Sleeping Pad is Designed to Perfectly fit Moon Lence Sleeping Bag and Intflatable Pillow. Have a reliable rest with Moon Lence Sleeping Set during Outdoor Adventures. Brand Quality & Money Back Guarantee: We offer unconditional 30-day money back guarantee and lifetime warranty to make it an absolutely risk-free purchase. 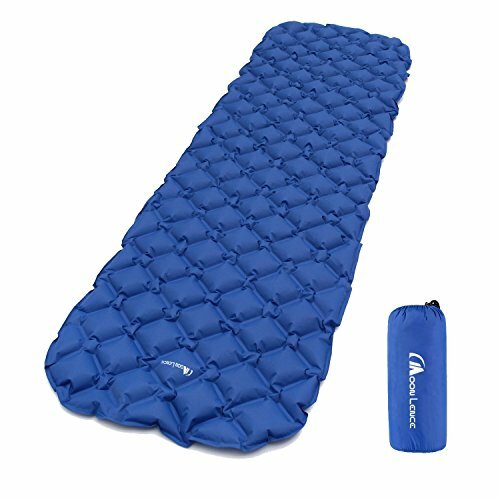 A Great Buy of Moon Lence Camping Set: Our Camping Sleeping Pad is Designed to Perfectly fit Moon Lence Sleeping Bag and Intflatable Pillow. Have a reliable rest with Moon Lence Sleeping Set during Outdoor Adventures.